JOHN, Earl of Comyn and Baron of Tonsburgh, Normandy, son of BALDWIN II of Boulogne, founder of the house of BLOIS, in France. EUSTACE DE BURGE, Baron of Tonsburgh, that of which we are now to treat. This Eustace had two sons, Charles and John, both companions in arms of WILLIAM THE CONQUEROR. WILLIAM, who assumed the name and arms of VESCI, and had a grant from HENRY II of Alnwick Castle. He was sheriff of Northumberland during the greater part of that reign, and was a principal commander in the battle fought near Alnwick, wherein the Scottish army sustained a signal overthrow. EUSTACE DE VESCI (1169-1216), one of the twenty-five feudal barons appointed to enforce the observance of MAGNA CARTA, married Margaret, daughter of WILLIAM, King of Scotland. WILLIAM DE VESCI, who espoused firstly, Isabel, daughter of William Longespée, Earl of Salisbury; and secondly, Agnes, eldest daughter of William Ferrers, Earl of Derby; and in right of the latter had a share of those lands assigned to him in Ireland, belonging to William Marshal, Earl of Pembroke. JOHN DE VESCI, who was summoned to parliament, 1264, as Baron Vesci. WILLIAM DE VESCI, who was summoned to parliament in 1295, and was one of the competitors for the crown of Scotland during the reign of EDWARD I. This nobleman was Justice in Eyre for all the royal forests beyond Trent, and one of the Justices-Itinerant touching the pleas of the forest, Governor of Scarborough Castle, and Lord Justice of Ireland, where he was Lord of Kildare. WILLIAM VESEY, having the misfortune to kill his antagonist in a duel, fled into Scotland, whence he removed to Ireland, in the reign of ELIZABETH I. THE MOST REV JOHN VESEY (1638-1716), was consecrated Lord Archbishop of Tuam. THOMAS VESEY (c1668-1730), who was created a baronet in 1698, denominated of Abbeyleix, Queen's County. Sir Thomas, subsequently taking holy orders, was consecrated Lord Bishop of Killaloe in 1713, and translated to the see of Ossory in the following year. SIR JOHN DENNY VESEY, 2nd Baronet, who was elevated to the peerage, in 1750, by the title of Baron Knapton. THOMAS, 2nd Baron (1735-1804), who was created, in 1776, VISCOUNT DE VESCI, of Abbey Leix. Selina, m Andrew Nugent, of Portaferry. Thomas Eustace Vesey, 7th Viscount(b 1955). The heir apparent is the present holder's second son, the Hon Oliver Ivo Vesey. ... The Veseys first appeared in Ireland in the second quarter of the 17th century and, like a surprising number of families, rose through service in the Church of Ireland. The first of them, the Venerable Thomas, ended up as Archdeacon of Armagh in 1655 and died in 1662. In 1995, the 7th and present Lord de Vesci sold Abbey Leix sold most of the demesne (excluding, however, the part which went with Knapton). The purchasers were Sir David Davies, an Irish-born and based international banker and businessman, and his wife, Linda, whose ‘spectacular restoration’ of the house carried forward the de Vesci tradition of improvement and was the subject of an article by Jeremy Musson entitled ‘Abbeyleix, County Laois ...’, published in Country Life on the 24th July, 2003. Prior to the sale of the house and its residual contents, Lord de Vesci had removed, among many other things, his collection of family portraits and the archive. However, later in 1995, agreement was reached for the sale of the latter to the National Library of Ireland, where it is now made more easily and widely accessible by the publication of the present catalogue. The de Vesci Papers are deposited at the NLI. Thomas Eustace Vesey, 7th and present Viscount de Vesci (b 1955) is managing director of Horticultural Coir Limited. 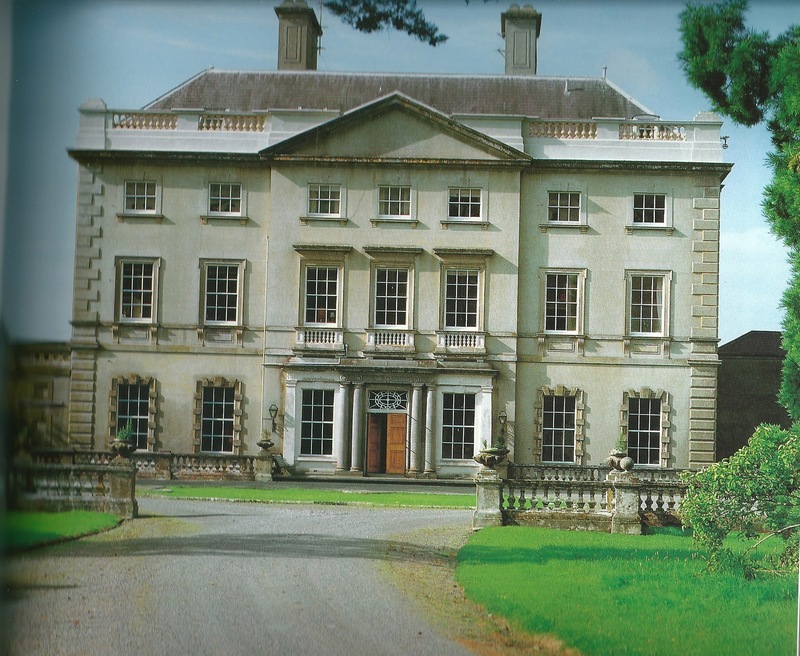 ABBEYLEIX HOUSE is a seven-bay, three-storey over basement with dormer attic Classical-style country house, begun 1773, with a pedimented breakfront having a cut stone Doric door-case to the ground floor. Five-bay elevation to garden front with breakfront having cut sandstone doorcase and Wyatt style window openings to flanking bays. Two-bay single-storey wing to west, renovated ca 1840, with façade enrichments added. It was extended to the west, post-1902, comprising a seven-bay single-storey wing with breakfront having three-bay advanced centre bay. Balustraded forecourt of ca 1840, to the north. Formal gardens, post-1839, to south comprising series of artificial terraces with balustrades, flights of steps and ha-has. The house is set within a landscaped demesne approached by gravel drive; balustraded formal courtyard to Entrance Front with gravel drive and grass centrepiece; group of formal gardens to Garden Front including series of artificial terraces with balustrades, flights of steps and rubble stone ha-has; pond to sheltered garden to south-west. 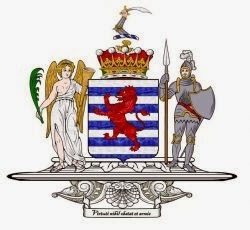 De Vesci arms courtesy of European Heraldry. First published in December, 2011. 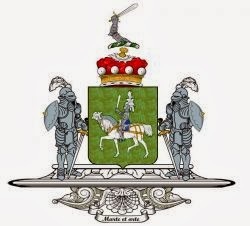 THOMAS MOR MAGUIRE, Lord or Prince of Fermanagh, Chief of the name of MAGUIRE, living in 1400, married Margaret, daughter of Con O'Neill, Prince of Tyrone. THOMAS OGE MAGUIRE, Prince of Fermanagh, born ca 1450, died in 1480. 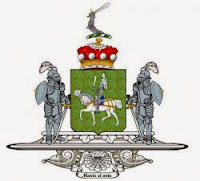 SIR BRYAN MAGUIRE (c1589-1633), Knight, was elevated to the peerage, 1628, by CHARLES I, as LORD MAGUIRE, BARON OF ENNISKILLEN, County Fermanagh, with limitation of the dignity to the heirs male of his body lawfully begotten. Rory, a colonel in the army. His lordship was buried in Aghavea, County Fermanagh. CONNOR, 2nd Lord (c1612-45), was one of the chief leaders in the rebellion of 1641, and one of its chief victims. He was tried for high treason in London, 1644, and being found guilty, was hanged at Tyburn. With him, the title became attainted. He had espoused Mary, daughter of Thomas Fleming, of Castle Fleming, and had a son. Several of the Maguire family, many of whom were in foreign service, assumed and were styled Lords Maguire. John O'Donovan has written an article about the Maguires of Fermanagh here. 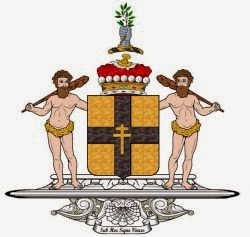 Maguire arms courtesy of European Heraldry. First published in January, 2011. This family was of great antiquity in Yorkshire. JOHN DE WANDESFORDE, of Westwick, near Ripon, married, in 1368, Elizabeth, daughter and heir of Sir Henry de Musters, Knight, of Kirklington, Yorkshire, and widow of Alexander Mowbray. THOMAS WANDESFORDE, of Kirklington, in 1503, who wedded Margaret, daughter of Henry Pudsey. SIR CHRISTOPHER WANDESFORD, Knight, of Kirklington, who received the honour of knighthood, 1586, and served as Sheriff of Yorkshire, 1578. Sir George espoused secondly, Mary, daughter of Robert Pamplin, and had a daughter, Margaret, and a son, WILLIAM WANDESFORDE, Citizen of London, to whom, and his heirs, his eldest brother, in 1637, gave £20 per annum, issuing out of the manor of Castlecomer, and payable upon Strongbow's tomb in Christ Church, Dublin. THE RT HON CHRISTOPHER WANDESFORD (1592-1640), being upon close habits of intimacy and friendship with Sir Thomas Wentworth, Earl of Strafford, accompanied that eminent and ill-fated nobleman into Ireland when he was constituted Chief Governor of that kingdom, was sworn of the Privy Council, and was appointed Master of the Rolls. Mr Wandesford was one of the Lords Justices in 1636 and 1639; and was appointed, in 1640, Lord Deputy; but the fate of his friend Lord Strafford had so deep an effect upon him, that he died in that year. SIR CHRISTOPHER WANDESFORD (1628-87), of Kirklington, who was created a baronet in 1662, denominated of Kirklington, Yorkshire. Mary; Eleanor; Catherine; Elizabeth; Alice; Frances; Christiana. THE RT HON SIR CHRISTOPHER WANDESFORD (1656-1707), who was sworn of the Privy Council by WILLIAM III, and again, in 1702, by Queen ANNE, who elevated him to the peerage, in 1706, as Baron Wandesforde and VISCOUNT CASTLECOMER. CHRISTOPHER, 2nd Viscount (1684-1719), MP for Morpeth, 1710, and for Rippon, 1714. In the latter year he was sworn of the Privy Council to GEORGE I, and the next year appointed Governor of County Kilkenny. In 1717, he was constituted Secretary-at-War. John Wandesford, 5th Viscount (1725–84) (created Earl Wandesford in 1758). THE LADY ANNE WANDESFORDE, who espoused, in 1769, John Butler, to whom the EARLDOM OF ORMONDE was restored by the House of Lords, 1791, as 17th Earl of Ormonde and 10th Earl of Ossory. THE HON CHARLES HARWARD BUTLER-CLARKE-SOUTHWELL-WANDESFORDE (1780-1860), of Castlecomer and Kirklington, inherited his mother's estates, and assumed, in 1820, the additional surname of CLARKE after Butler; and, in 1830, the additional surnames of SOUTHWELL-WANDESFORDE after Butler-Clarke. SARAH, of Castlecomer and Kirklington. Mrs Prior-Wandesforde succeeded to the Castlecomer and Kirklington estates on the death of her nephew, 1881, and in accordance with the provisions contained in her father's will, assumed, in 1882, for herself and her issue the additional surname and arms of WANDESFORDE. During Lady Ormonde’s time on the estate, the coal mines were mainly run by master miners who leased the land and employed teams of about fifty men to operate them. Her son, Charles Harward Butler-Clarke-Southwell-Wandesforde, took a great interest in the running of the estate and in the welfare of his tenants and attempted to reduce the role of "middle men" by reducing rents and providing assistance. He even helped some of his tenants to emigrate. He was succeeded by his daughter Sarah, who married John Prior. She outlived all her children and was succeeded by her grandson Richard Henry who inherited the estates and assumed the Wandesforde name in 1892. When Captain Richard Henry Prior-Wandesforde inherited the estate in the late 19th Century, the family owned thousands of acres of woodland in the area. In previous years, the mines had been operated by master miners who leased the mines from the Wandesforde family, but ‘the Captain’ took personal control of the mines. He introduced many improvements in the mine workings including overhead ropeways to transport the coal to the Deerpark railway depot. He also established the Castlecomer Basket Factory, the Castlecomer Agricultural Bank and the Colliery Co-operative Society and built a number of housing schemes for the mine workers. Captain Prior-Wandesforde took personal control of the coal mines and invested his own money in upgrading and modernising the mine workings. CASTLECOMER HOUSE in County Kilkenny, the family seat, was originally built in 1638. It was burned down during the battle of Castlecomer in 1798. A larger house was built in its place, in 1802, during the time of Lady Ormonde. It was a very large 18th and 19th century mansion consisting of a square, two-storey main block with fronts of five bays; a slightly lower three-storey wing of great length. There was a battlemented parapet on the main wing and block; rectangular sash windows, mostly astragals; and an enclosed Gothic porch. Most of the building was demolished in 1975 as it was no longer in use and had fallen into disrepair. Nothing now remains of the house. Castlecomer Discovery Park is situated on grounds that once formed part of the Wandesforde family estate. The Visitor Centre is located in what was originally the farm yard and kitchen gardens of the estate. The stables and many of the farm buildings have been restored and now house the craft units and the education facilities. The original walled garden is now home to a small herd of Fallow and Sika Deer and a flock of Jacob Sheep. First published in December, 2011. SIR ROBERT ADAIR, who received the honour of knighthood from CHARLES I, married Jean, daughter of Archibald Edmonstone, of Duntreath, in Stirlingshire. SIR ROBERT ADAIR, of Kinhilt and Ballymena, who raised a regiment of foot and a troop of horse in the service of WILLIAM III, and received the honour of knighthood from that monarch on the field after the battle of the Boyne. SIR ROBERT ALEXANDER SHAFTO ADAIR (1811-86), 2nd Baronet, of Ballymena Castle, married Theodosia, daughter of General the Hon Robert Meade, second son of John, Earl of Clanwilliam. Sir Robert, MP for Cambridge, 1847-57, was elevated to the peerage, in 1873, as BARON WAVENEY, of South Elmham, Suffolk. THE CASTLE, Ballymena, County Antrim, was a large Scottish-Baronial Victorian house built in the 1870s for Sir Robert Adair, later 1st Baron Waveney. 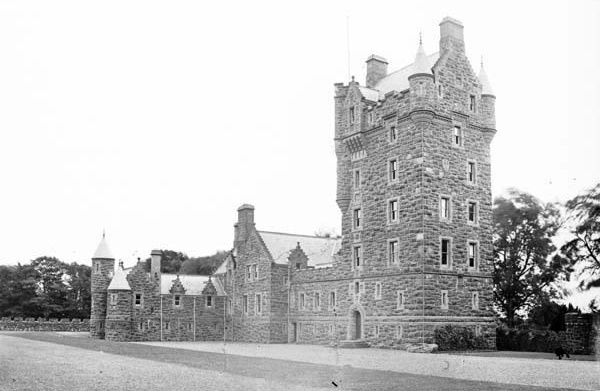 It had a massive seven-storey tower at one end was built by Lanyon & Lynn of Belfast. The original castle, built by the Adairs, was burnt in 1720. 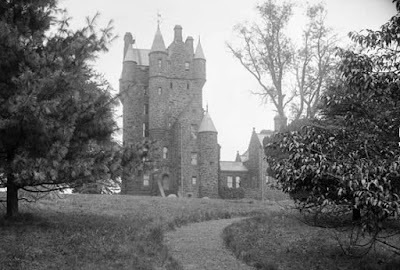 The Adair estate at Ballymena was sold to the tenants in 1904 and the castle fell into disuse. The castle was still standing in 1953, but badly damaged by arson in 1955 and condemned as unsafe the following year. 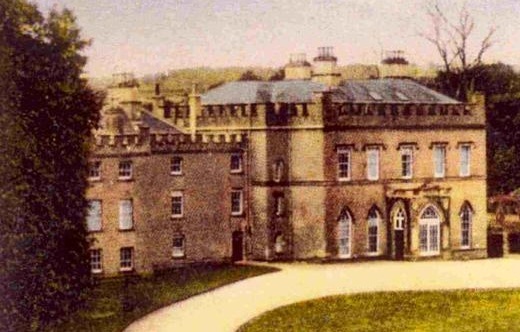 When the local council demolished it in 1957, Sir Allan Adair bought Holy Hill House, near Strabane, County Tyrone, and installed ten stained glass windows from the castle there, where they remain today. ROBERT STRATFORD, a younger branch of the house of MEREVALE, and the first who settled in Ireland, one of the original burgesses in the charter constituting Baltinglass a borough. Grace; Mary; Elizabeth; Abigail; Jane; Anne; Catherine. EDWARD STRATFORD (1664-1740), who purchased Great Belan, and other lands in County Kildare, from the Viscount Fitzhardinge. This gentleman was a staunch supporter of the Revolution, and entertained WILLIAM III at Belan. JOHN STRATFORD (c1691-1777), MP for Baltinglass, 1721-59, during the reigns of the first three GEORGES, was raised to the peerage, in 1763, by the title of Baron Baltinglass; and advanced to a viscountcy, in 1776, as Viscount Aldborough. His lordship was further advanced, in 1777, to the dignity of an earldom, as EARL OF ALDBOROUGH, and Viscount Amiens. He married Martha, daughter and co-heir of the Ven. Benjamin O'Neale, Archdeacon of Leighlin, by whom he had six sons and nine daughters. EDWARD, 2nd Earl (1736-1801), who espoused firstly, Barbara, daughter of the Hon Nicholas Herbert, of Great Glemham, in Suffolk; and secondly, in 1788, Elizabeth, only daughter 1st Baron Henniker, though the marriage was without issue. BENJAMIN O'NEALE, 6th and last Earl (1808-75), Captain, 15th Light Dragoons, who died unmarried, at Alicante, Spain, when the titles expired. It was built in 1743 for the 1st Earl of Aldborough by Richard Castle, in collaboration with Francis Bindon. Belan comprised three storeys; an eleven-bay front; three centre bays and the two outer bays breaking forward. A central Venetian window was above the tripartite doorway. The roof parapet had recessed panelling and urns. There was also an elegant stable block; and a domed Doric rotunda in the park. 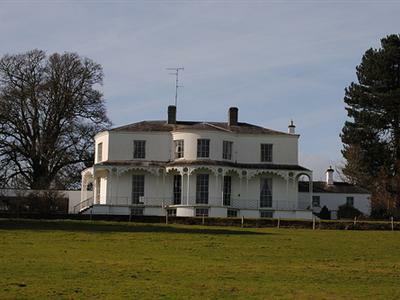 Belan House remained intact, though inhabitable, until 1837, when the family left owing to impecunious circumstances. During the lifetime of the 4th Earl, owing to his reckless gambling and extravagant mode of living, the property became heavily mortgaged. 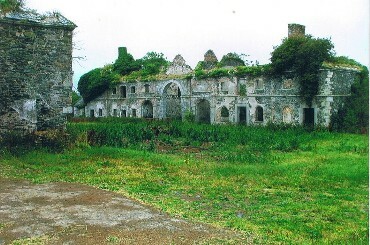 After 1823, the estate became neglected. During Lord Aldborough's absence abroad, it is said that the family lawyer, a man named Lewis, illegally obtained a long lease of Belan and, together with a friend of his named Mercer, brought about the dismantlement of the house and demesne by gradually auctioning off every stick and stone they could move. The cut-stone work of the parapet and other parts of the house were sold, and used in the erection of public buildings in Athy; the furniture and chimney pieces were parted with, and the statuary in the grounds suffered a similar fate; the doors and shutters are said to have been used for flooring the stable lofts at Newtown House, near Bolton Castle. For miles around there is hardly a place which does not possess some fragments of Belan's former grandeur. At Bolton Castle, in the garden, is a block of composite, bearing the Aldborough crest. The great iron gates within view of the hall door at Carton House originally hung at the Belan gate lodge. The only trace now showing the extent of Belan demesne in former times are three stone obelisks. 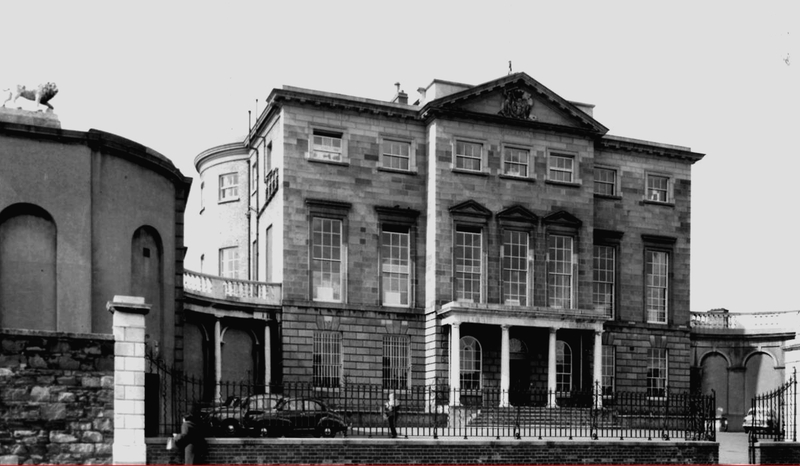 ALDBOROUGH HOUSE is amongst the most important surviving historic houses in Dublin. Located on Portland Row, it was the last great mansion to be built in Dublin city during the second half of the 18th century. Aldborough House was built in 1796 by Edward, 2nd Earl of Aldborough, from whom Aldborough Place, Amiens Street and Stratford Row receive their names. Stratford House was the family's town residence in London. 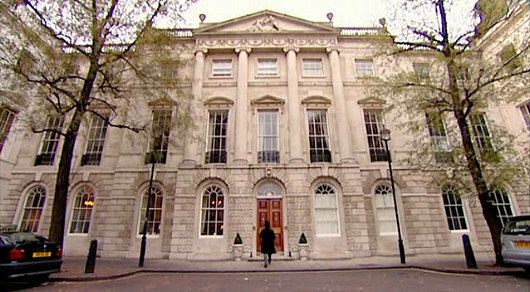 STRATFORD HOUSE, Stratford Place, the family's London residence, is now the premises of the Oriental Club. The building was constructed in the 1770s for the 2nd Earl, who paid £4,000 for the site (formerly occupied by the Lord Mayor of London's Banqueting House) along with the Robert Adam-inspired building. The House was variously remoulded over the years with new plumbing and a second storey on the east and west wings in the 1890s. However it was in 1908 when Lord Derby bought the lease that the most extensive alterations were set in motion. He purchased additional property in Marylebone Lane, removed the stables and built a Banqueting Hall with a grand ballroom above (the last privately owned ballroom to be built in this country). It was a spectacular room of Italian design which was converted when the house was acquired by the Oriental Club. When Stratford House was purchased by the Oriental Club in 1960, it was necessary to make certain alterations, as the needs of a Club were different to those of a town house of the nobility. The ballroom was converted into two floors of bedrooms, additional lifts were installed and alterations to the Banqueting Hall were made, which is now the Dining Room. The recent addition of eight new bedrooms continues the Oriental Club's tradition of providing a welcoming and comfortable home-from-home for its Members in the centre of London. First published in August, 2013. Aldborough arms courtesy of European Heraldry. The family of HILL descends from Samuel Hill, Cromwell's treasurer in Ireland ca 1648, Burgess of Londonderry, who was granted land in counties Armagh, Tyrone, Antrim and Londonderry. This family came from Buckinghamshire and, latterly, Coleraine, County Londonderry. Elizabeth; Sophia Beresford; Mary; Letitia. 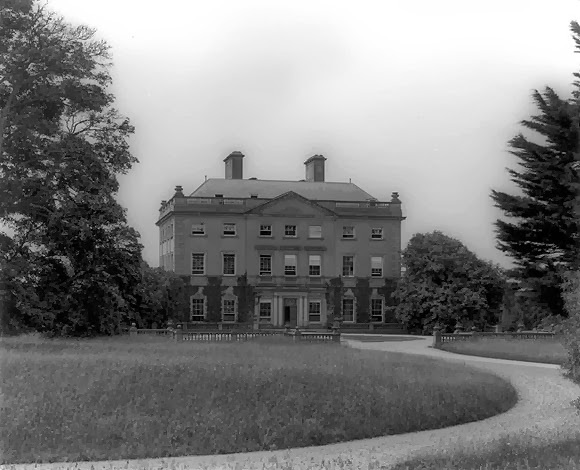 Mr Hill, MP for Londonderry City, 1768-95, and Collector of that port, was created a baronet in 1779, denominated of Brook Hall, County Londonderry. THE RT HON SIR GEORGE FITZGERALD HILL, 2nd Baronet (1763-1839), Privy Counsellor in Ireland, a trustee of the linen manufacture, Colonel, Londonderry Militia, MP for Londonderry, 1795-1830; and successively Clerk of the Irish House of Commons, Vice-Treasurer of Ireland, Governor of the Island of St Vincent, and Governor of Trinidad. 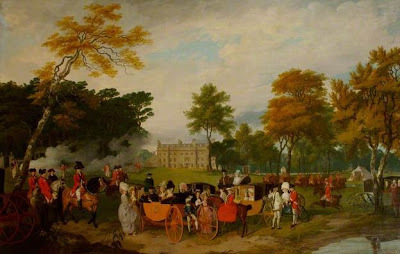 Sir George espoused, in 1788, Jane, third daughter of the Rt Hon Lord John Beresford, brother of George, 1st Marquess of Waterford, which lady dsp 1836. Charlotte Elizabeth; Letitia Catherine; Mary Maud; Louisa Isabella. SIR HENRY BLYTH HILL, 6th Baronet (1867-1929), DSO, Captain, Royal Irish Fusiliers, who wedded, in 1907, Eliza Maud, daughter of George Bowdler Gipps, and had issue, an only child, JOHN PATRICK (1909-10), who died in infancy. SIR GEORGE ALFRED ROWLEY HILL, 9th Baronet (1899-1985). Sir John Alfred Rowley Hill, 11th Baronet (b 1940). Sir John Alfred Rowley Hill, 11th and present Baronet (b 1940), lives in Leicestershire. The Hill Papers are held at the Public Record Office of Northern Ireland. During the Siege of Derry in 1689 Brook Hall (above), at Culmore, was the headquarters for JAMES I's army and the house was occupied by the Duke of Berwick, who commanded His Majesty's army. The original house was replaced ca 1780 by an elegant villa to the north of its site, where extensive landscaping took place. This house was altered ca 1816, when the balcony was added and it took on its Regency-style appearance. The estate was purchased in 1852 by Samuel Gilliland, who planted the demesne with its rare ornamental trees and shrubs. David Gilliland is head of a family of quite remarkable achievement and social conscience. 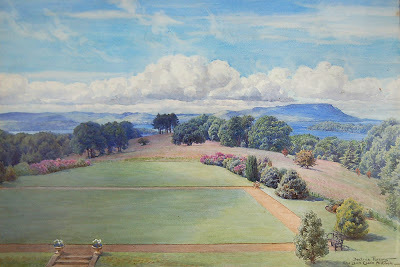 Married to the novelist Jennifer Johnston, David, a Londonderry solicitor, inherited Brook Hall and has continued the family passion for gardening by restoring, maintaining and improving the estate's gardens of azaleas, rhododendrons and flowering shrubs, as well as an arboretum harbouring over 900 specimens of conifers and deciduous trees. Brook Hall is listed on the UK’s Register of Parks, Gardens and Demesnes of Special Historic Interest. When the house was built ca 1780, surrounding land was acquired to create a landscape park, which slopes down to the River Foyle. The house, lodge and gates are listed. Much original planting remains including parkland oaks, beeches and chestnuts. Upon the grounds, evidently neither expanse nor skill has been spared in furnishing and maturing one of the most luxuriant collections of shrubs I ever beheld. There is also more recent planting of considerable interest in the arboretum, begun in 1932 by Commander Frank Gilliland, RNVR. This important collection, which occupies about 35 acres west and south west of the house, has been continuously enlarged over the years. The present owner, who succeeded to the property in 1957, has catalogued the collection. The walled gardens are partly cultivated. Nearby lies the National Collection of Escallonia. The gate lodge, one remaining of two, was built ca 1820 and is listed with the house and gates. First published in January, 2011. Castle Archdale was one of the largest estates in County Fermanagh. 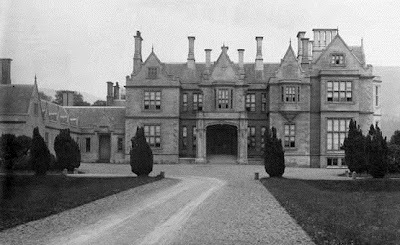 Ely Lodge, Crom, Florence Court and Castle Archdale all comprised about 30,000 acres or more. I have already written at length about the manor house and Archdales. 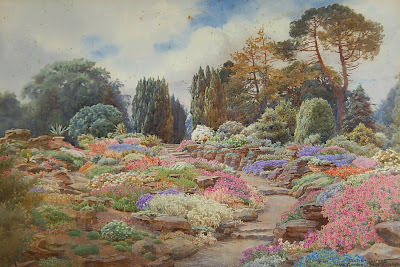 The Rock Garden was painted by Beatrice Emma Parsons in 1895. The painting above depicted the view from the front of the manor house in 1895. There used to be a tennis-court here. Beatrice Emma Parsons (1869-1955) was a sister of Karl Parsons, the stained-glass artist. First published in August, 2011. I have posted this picture of my sumptuous pudding at The French Rooms for a loyal reader, who inquired about whether I'd had dessert at The French Rooms. Here it is in all its splendour. I've been spending a few days at Portballintrae, County Antrim, on Ulster's north coast. The weather has really been very good, mostly sunny in fact. I explored Ramore Head and the headland at Portstewart, places I was unfamiliar with. On Friday evening I dined at The French Rooms, a restaurant, café and artisan shop in Bushmills. Bushmills, probably my favourite village in County Antrim, is a mere hop, skip and jump from Portballintrae. It usually suits me to dine early, so I had reserved a table for six-thirty. On arrival I was shown to a lovely little table, directly opposite the bar counter, which happened to have particularly comfortable leather chairs. In fact I quipped to the waiter at the time that they were reminiscent of some ancient Bentley or Daimler. The staff here are engaging and courteous. Having perused the excellent menus, I opted for Spicy Prawn Pot on Spicy Leaves as a starter. The trusty nose-bag was donned and I tucked in to a dainty little pot of prawns, dressed in a kind of seafood sauce. I had motored in to the village, so simply had iced water with the meal. After a short interval my main course arrived, viz. Cajun French Sea Bass, oven-baked and drizzled with a dill-infused rapeseed oil dressing. I also had creamed purée potatoes and roast beetroot and cherry tomatoes with it. The sea bass was delicate, moist, mild, boneless, and complemented my vegetables famously. I seldom indulge in three courses; the fine list of puddings, however, seduced me, as it were. 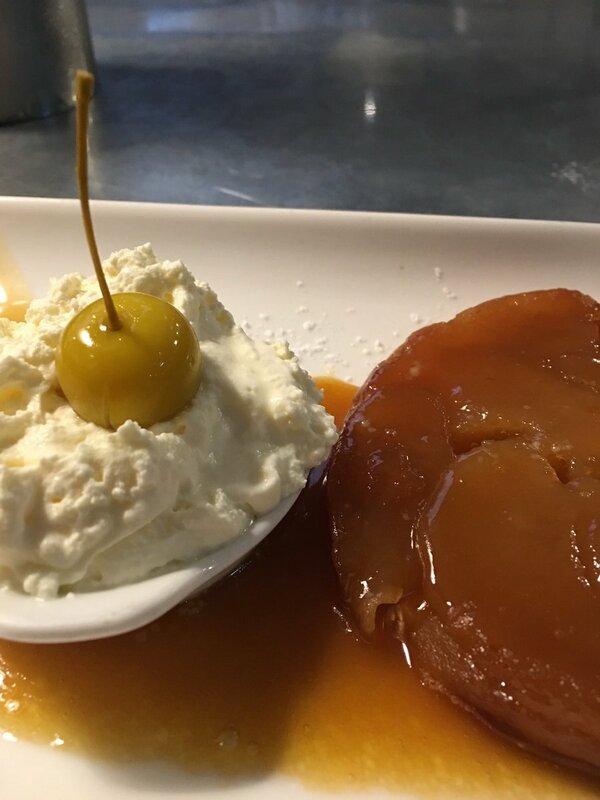 Tarte Tatin, the traditional Gallic apple dessert, with toffee sauce and fresh whipped cream, proved to be irresistible. The thinly-sliced apples almost literally melted in the Belmont mouth. The layer of pastry underneath was barely discernible, though complemented it perfectly. During the course of my dinner I chatted with the waiter, recounting tales of The Ugly Ducking in Corralejo, Canary Islands, which was so outstanding and popular that it had to turn away most passers-by. Another restaurant across the street gained the extra business. This was the case with The French Rooms last night, so it is advisable to book ahead for dinner. I had the iPad and headphones with me, the plan being to settle self in the Bushmills Inn a few doors up, so I approached the counter to settle my bill. To my utter astonishment the staff apprised me that my bill had been paid for by an American couple. They had been seated at a table twenty or thirty feet away, though I never caught their eyes or even encountered them. I still have no idea who they were or where they were staying. This was an opportunity for another good turn, so I gave the staff a good tip instead. I don't think I've enjoyed myself so much at a restaurant for years. Since the merging of the elder branch of the family of CLIVE, by the marriage of the heiress of the last Herbert, Earl of Powis, with the son of the celebrated General Lord Clive, the chieftainship of the name seems indubitably to rest with HERBERT of Muckross, in County Kerry. 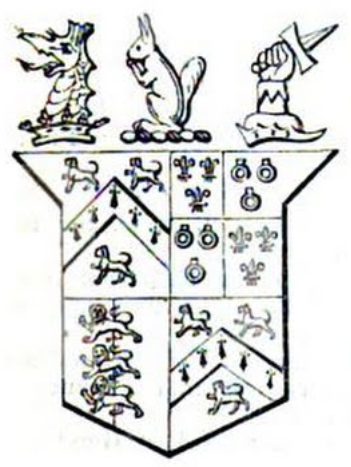 Descended from Thomas Herbert, of Kilcow, he went to Ireland under the care and patronage of his relative Lord Herbert of Chirbury and Castleisland, in 1656; which Thomas was the son of Matthew, the son of Sir John, the son of Sir William, the son of Sir Matthew, of Colebrook, only brother of the Earl of Pembroke of the 1st Creation. These brothers suffered as Yorkists in the wars of the Roses. The heir-general of the Earl of Pembroke married into the family of Somerset, Earl of Marquess of Worcester, and Duke of Beaufort. 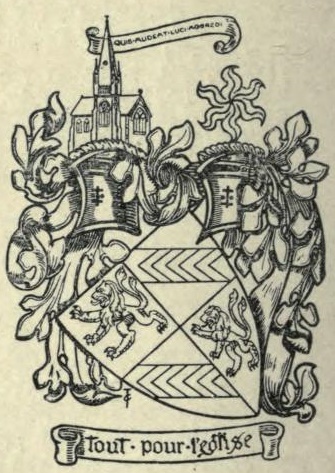 From Richard Herbert descended in the younger branches the Lords Herbert of Cherbury, afterwards Earls of Powis, and Herbert, Earl of Torrington, both extinct in the male line; while from a senior, but never ennobled branch, the family of Muckross and Kilcow now remains the existing and legitimate representative of the famous name of HERBERT. The Herberts were granted land in County Kerry during the reign of ELIZABETH I.
HENRY ARTHUR EDWARD KEANE HERBERT JP (1867-1931), died unmarried. 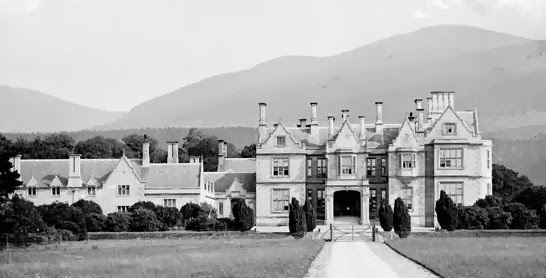 Smith indicates that two members of the family received lands in Kerry after the Desmond rebellion, Sir William Herbert receiving over 13,000 acres; while Charles Herbert received over 3,000 acres. Over the next three centuries they were to remain amongst the foremost families in County Kerry. Henry Arthur Herbert was one of the principal lessors of property in the baronies of Dunkerron North and Magunihy, as well as holding some property in the barony of Trughanacmy, at the time of Griffith’s Valuation. The family fortunes declined systematically in the late 19th century and most of the estate was sold in the 1890s. 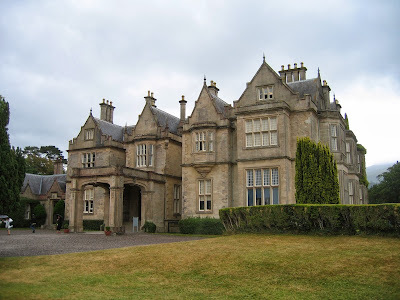 MUCKROSS HOUSE, County Kerry, is an irregular-plan, six-bay, two-storey over basement, quadruple-gable-fronted, Elizabethan-Revival style country house with dormer attic, built between 1839-43, designed by William Burn. It is situated close to the shores of Muckross Lake, amidst the beautiful scenery of Killarney National Park. The house is a focal point within the park. It was built for Henry Arthur Herbert and his wife, the watercolour painter Mary Balfour Herbert. This was the fourth house that successive generations of the Herbert family had occupied at Muckross over a period of almost two centuries. Originally it was intended to build a more ornate house than that which exists today. The plans for a larger servants' wing, stable block, orangery and summer-house are believed to have been altered at Mary Herbert's request. Today the principal rooms are furnished in period style and portray the elegant lifestyle of the 19th century gentry; while, in the basement, one can imagine the busy bustle of the servants as they went about their daily chores. During the 1850s, the Herberts undertook extensive garden works in preparation for Queen Victoria's visit in 1861. Later, the Bourn Vincent family continued this gardening tradition. They purchased the estate from Lord and Lady Ardilaun early in the 20th century. It was at this time that the Sunken Garden, Rock Garden and Stream Garden were developed.